Sign me UP to be SoleAwesome! START/FINISH LOCATION: Deer Lake- Burnaby. Come join us for the MOST FUN funrun you've ever done!! 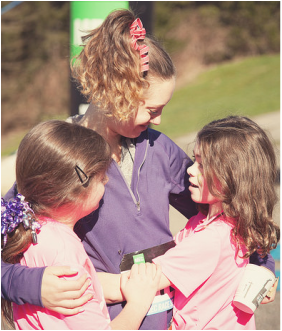 Support girls' mental health, and fun physical activity while getting active with your family!! Think 3-legged race, high five stations, lots of enthusiasm and more! Race kit pick up at Fit First in Burnaby on Saturday May 23 from 11am-3pm. WARM UP with Sole Girls at 8:30am!!! Can't come but want to MAKE A Donation? : Every Donation goes towards the Sole Girls Scholarship Fund. Check out the video from our last run!